Place racks in upper and lower thirds of oven; preheat to 425°. Toss carrots, cauliflower, and oil on a large rimmed baking sheet. Season with salt and toss again. Place sweet potatoes on a small foil-lined rimmed baking sheet. Roast veggies, tossing once, until browned and tender, 25–30 minutes for carrots and cauliflower and 35–40 minutes for potatoes. When temperatures drop and our feeds start to fill with other people’s beach vacation photos, we need a little convincing to eat our vegetables. Take roasted broccoli: It’s one of our go-to winter staples, but it definitely needs some zhuzhing to take our attention away from, say, baked pasta. 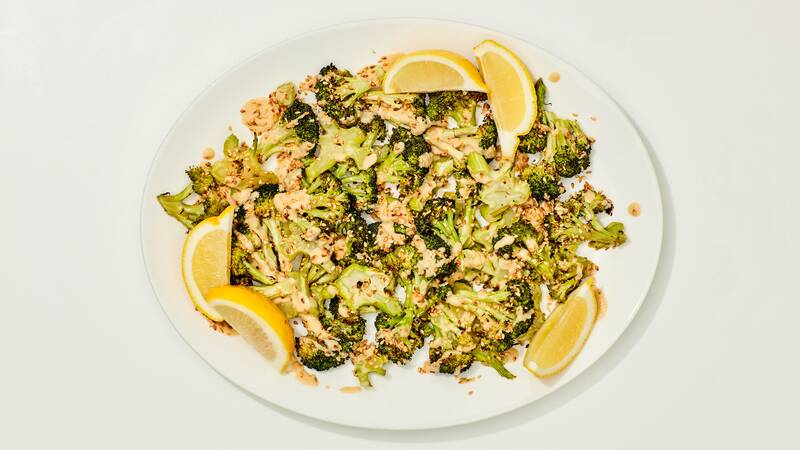 Luckily, senior food editor Chris Morocco developed a roasted broccoli recipe that’s going to keep our attention all season long. 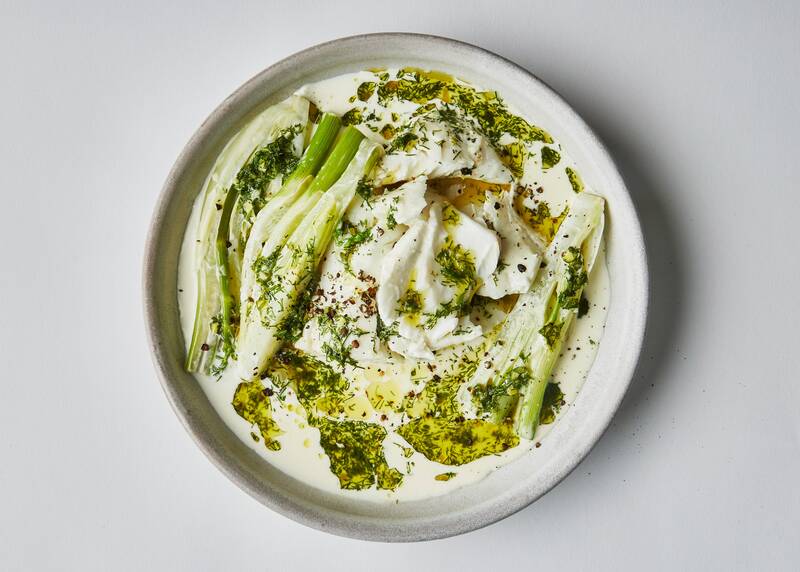 The weeknight-friendly recipe dunks blanched broccoli in a vibrant yogurt marinade fortified with warm spices like hot paprika, coriander, and turmeric. The yogurt tenderizes the tough broccoli florets while they cook, and, thanks to the dairy and spice-combo, the broccoli develops a delicious, almost cheese-like crust. It’s not not reminiscent of a nacho cheese Dorito, and it’s much more delicious than broccoli is normally allowed to be. The first secret to creating craveable broccoli is blanching the florets. This process isn’t totally mandatory, but it helps break down the fibrous vegetables so that they’ll roast faster and become more tender. Just blanch the broccoli in a small pot of boiling salted water until its bright green (which should only take 30 seconds or so). Trust us, you’ll be glad you did. The other key is to create layers of flavor in your yogurt marinade. Morocco opted for a base of hot paprika, ground coriander, and ground turmeric, then added a finely grated garlic clove and a few dashes of hot sauce for a hint of heat. Feel free to experiment with other additions like garam masala or fresh ginger. No matter your flavor profile, be sure to thoroughly toss the broccoli in the yogurt marinade to ensure an even coating. Then roast on a foil-lined baking sheet to save yourself some cleanup. Nobody likes scrubbing roasted yogurt off a sheet tray. Once the broccoli is browned and the stalks are tender, it’s time to serve. I used my broccoli to top a chickpea-quinoa grain bowl, adding a generous dusting of nutritional yeast to double down on the cheesy flavor. After a week of holiday parties (and holiday cookies), it felt good to eat something green. And two helpings of broccoli later, my rugelach equilibrium was rebalanced. Your roasted broccoli recipe could use an upgrade. Yogurt isn’t just for marinating proteins; it’s also a great vehicle for vegetables that could use a little help. Meanwhile, whisk yogurt, oil, paprika, coriander, turmeric, garlic, and cayenne in a medium bowl. Season with salt. Add broccoli and toss to coat. Transfer broccoli mixture to a foil-lined rimmed baking sheet and arrange in a single layer. Roast broccoli until browned and stalks are tender, 15–20 minutes (unblanched broccoli may take as long as 25 minutes).